René van Rems AIFD of René van Rems International in Vista, Calif. has been recognized with the American Institute of Floral Designers' (AIFD) Award of Distinguished Service to the Floral Industry. This news was announced on July 13 during the Institute's 2009 Awards Ceremonies held in conjunction with it's 2009 National Symposium in Kansas City. This award is presented to AIFD members who have made a significant contribution to the floral industry. Rene was chosen for his continued support of the floral industry through growers, wholesalers, garden clubs, students and members of the institute. 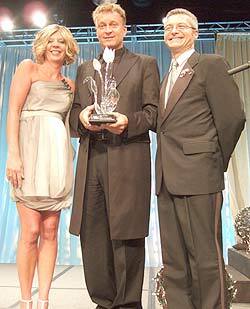 Pictured right: (l-r) AIFD Awards Chair Lori Novak AIFD stands with René van Rems AIFD. AIFD Past President Walter Fedyshyn AIFD, PFCI is on his right. VISTA, CA - Flower lovers everywhere will know what the top floral design magazines and institutes, as well as the finest art museums and others already know: René Van Rems, AIFD, is the world-renowned ambassador of the floral industry. His acclaimed book, "Rene's Bouquets - A guide to Euro-style Hand-Tied Bouquets," will be published with the general public in mind with its second printing. "The book has been a great success in the floral industry but I felt it was time to bring it to a different audience - flower lovers who want to learn easy, but sophisticated design and those who love coffee table books filled with gorgeous pictures of beautiful flowers," Van Rems says. "Originally intended for the industry, the public has been buying it for themselves and for gifts, so I've revised to become very consumer-oriented." On the cover of the book is one of Van Rems signature creations. A rich juxtaposition of deep reds, burgundy and acid greens, velvety "Black Baccara" roses and fuzzy red kangaroo paws draw out the tiny red centers of petite, green euphorbia flowers. With birch twigs as an accent, the textures and contrasts in form complete the stunning, yet simple, design. The 136 page hardcover book is printed on thick, glossy paper filled with dozens of innovative and colorful hand-tied bouquets and arrangements. Inside is a veritable garden of ribbon-tied monochromatic bouquets, exotic orchids and ginger wrapped in tropical foliage, flowers nestled within foliage or branch structures - even Gerbera daisies cradled whimsically in nori, the seaweed used to wrap sushi. It also includes educational sections on technique, flower forms and care and handling. The educational aspects are important because Van Rems isn't your typical celebrity designer. He is a top speaker, educator and demonstrator, leading workshops, design shows and seminars in the U.S., Europe and Asia. He is also frequently featured at fine art museums events such as "Arts Alive" in San Diego, where floral designers interpret works of art with their creations. His expertise has led him to appear in Better Homes & Gardens, Sunset Magazine and on HGTV, as well as earn him several awards from the floral design industry. 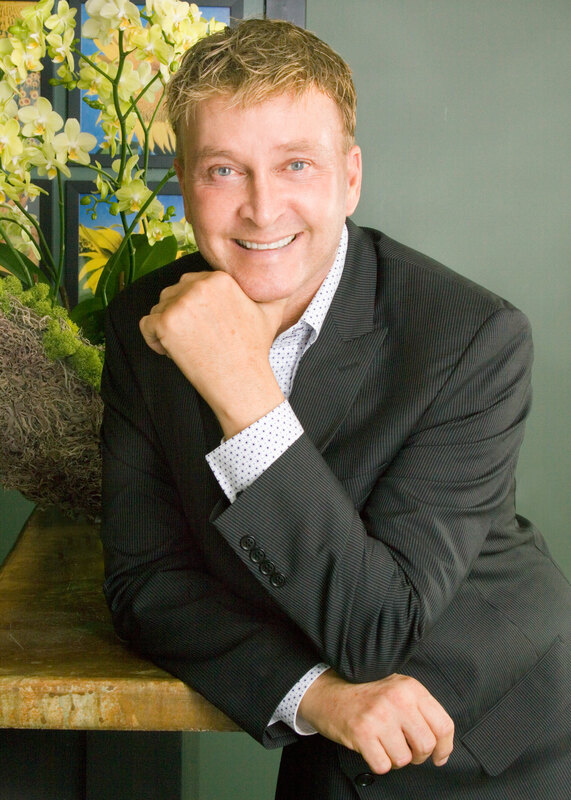 Van Rems has been influential in bringing the European influence to American floral design. Originally from Amsterdam, Van Rems was formally educated at the prestigious Rijksmiddelbare Tuinbouwschool Floral Insitute at Aalsmeer. For the last twenty years, he has lived in San Diego, California. "René Van Rems lifts the veil of mystery surrounding classic European design and hand-tied bouquets," says Lee Murphy, retired president of the California Cut Flower Commission and long-time member of the national floral industry. "His easy-to-follow instructions will allow anyone to learn these sophisticated, creative, but simple techniques. Others will simply enjoy the beauty of the book. Over the years, René has shown his mastery in design and now he shares his secrets with us." "Rene's Bouquets - A guide to Euro-style Hand-Tied Bouquets," retails for $39.99, plus shipping and handling. It can be purchased at www.renevanrems.com or Amazon.com. Wholesalers and retailers, gift and floral industries, should contact Rene van Rems International directly for volume discounted pricing. René Van Rems International is a diversified design, consulting, marketing and publishing company headquartered in Vista, California. Established in 1986, the firm has worked for many of the top manufacturers and growers in the floral industry on a global basis.